A traditional hammock will usually hang well in any space of around 3.30m to 4.00m, depending on the length of the hammock. The end hanging points of your hammock should typically be mounted between 1.60 m and 2.40 m off the ground. This is a guide and heights can be higher or lower, should the need arise. If you have less space, you can try hanging the hammock higher or you can make a knot close to the end loop of the hammock. This helps to shorten the length of the hammock without affecting the overall comfort. 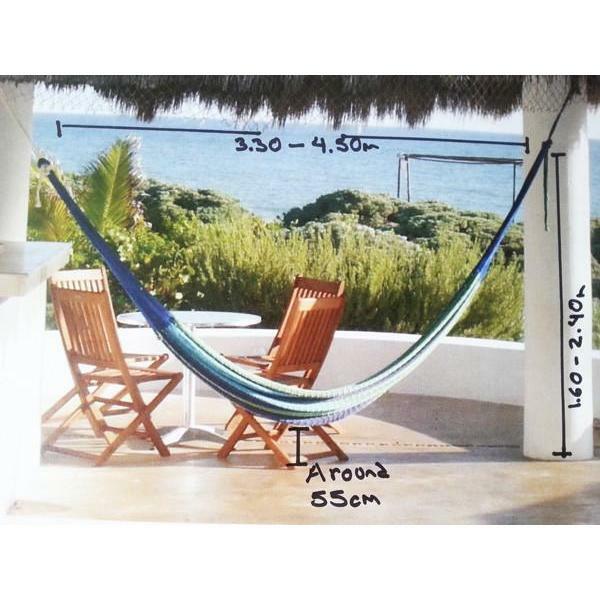 To hang hammocks with spreader bars (Resort hammocks) like the photo below, you should use a hanging distance similar to the length of your hammock (from loop to loop). For example if the total length of your spreader bar hammock is 3.70 m, your hanging distance will be a minimum of 3.70m. If your space is wider, just loosen your accessory ropes or straps to reach the loops of your hammock. This is because resort hammocks are not hung in a loose banana shape like traditional hammocks, they should rather be hung quite tight and flat. Below is a guide on our recommendation of what accessories to use for each type of hammock hang. These are only guides and you can always use other accessories or even your own DIY parts. Hanging your hammock on a stand is the easiest way as all the hard work has been done for you, especially if you go for one of our Hammock combos. Typically, traditional hammocks work better on a hammock stand than resort hammocks. Resort hammocks can sometimes scrape their spreader bars against the stand, especially on the steel hammock frames. That’s not to say a little bit of DIY shortening or tightening can’t overcome the issue. To fix a hammock to a tree you will need a hammock and a strap fixing like our Tree Straps or rope. The straps or ropes wrap around each tree and then link to the loops on your hammocks. Adjust the straps or rope to increase or decrease the tension to suit the distance between your trees. Tip: Measure the distance between your two trees. Choose your hammock. Now ensure the hammock’s total length is at least 1 metre less than the total distance between the trees to give enough distance for your strap or rope fixings. To attach your hammock to a wall you will need a Double Hook Kit, or something similar which you can drill into the wall securely. If you want to give your hammock further flex, you can add a Hammock Spring which will absorb the shock and tension but is usually used for when hanging a hammock chair. Fixing a hammock into wood is easy and often customers choose to hang the hammock from beams on the roof, ones which run down the wall or even sink their own post into the ground. A Double Hook Kit or Screw Hooks are both up to the task for this requirement. You can also use a number of options available from your local hardware. 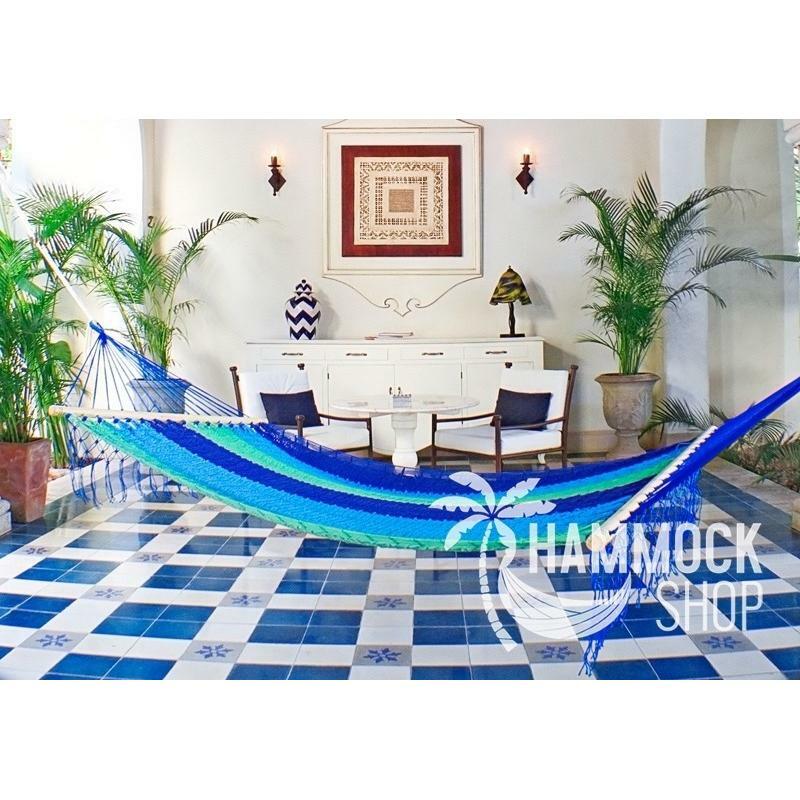 If you want to create a larger arch or you are hanging a hammock chair, then you will need a Hook Kit or Screw Hooks to suspend your hammock from a fixed point on the ceiling. You must ensure however, that the hanging point is secure and strong. Often, customers will ensure that the hanging point is secured to a wooden beam within the ceiling. For ceiling suspensions, a Hammock Spring is always popular and highly recommended to ensure a soft and comfortable suspension.